Last week, I took my brother and sister onboard of one of my flight lessons. Ahead of the flight I reminded my instructor that I would bring them along and asked what flight route should I prepare. His response: “prepare the weight and balance report, the destination will be a surprise”. And so I did. For those not initiated, each aircraft has a defined maximum take off weight (MTOW). Before the flight, the pilot needs to ensure that the aircraft will be below that weight. On top of that, the centre of gravity must be within certain limits. That is the weight and balance (1). For a small simple aircraft like the Robin DR-44 we flew, it is a rather easy calculation that can be done with a pencil. See in the image below two ways of calculating it: making the numbers or using the graphic at the bottom of the image. Weight and balance report for Robin DR-44. Let’s review the numbers. We flew the DR-44 with immatriculation F-GSRR, which empty weight is 616kg. I estimated that the instructor and I, fully dressed and with headsets would weight ~160kg. My brother and sister behind, another 160kg. Baggages: I almost emptied mine and weighted it, 2.5kg. My instructor’s one is rather heavy, I assumed that together they would be 10kg. Principal fuel deposit: 110L of Avgas, with a density of 0.72kg/L, 79.2kg. Another 50L for the reserve deposit, 36kg. What to do then? Clearly, the aircraft is a given, so weight shall be reduced from somewhere else. But, from where? Either we left someone on ground or reduced baggage weight (my instructor left his and brought along only a book with aerodrome charts). However, baggage weight contributed only 10kg to the initial calculation. I then calculated: what is the maximum fuel we can carry? Forget the reserve deposit: 36kg less. Let’s go with the principal deposit. What is the maximum fuel volume that would enable us to be within the 1,000kg limit? It would be somewhere about 80L (vs. the capacity of 110L of the deposit). 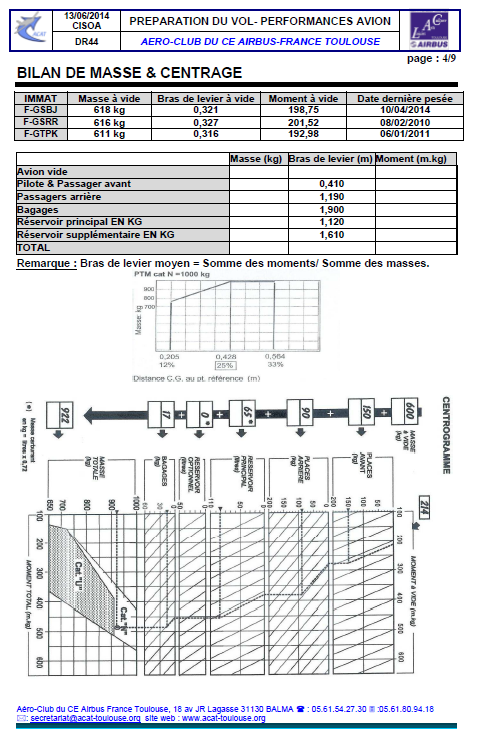 When I arrived to the aerodrome, I came with the message to my instructor: “Thierry, we can only carry 80L, if the plane is filled up with fuel, is there a way to purge it?” “No.” I then explained the numbers I had made and we went through them together. Next step: check the fuel indicator of the plane… ~3/4… or about 80L, with the reserve deposit empty. We would be just within the limit! We then proceeded with the preparation of the route, the pre-flight check, etc., and had good time with the flight (see report of the experience by my sister, in Spanish). From this experience I learned a take away for future flights: when finishing your flight, it is normal etiquette towards the next pilot to refuel the aircraft if you see that the deposit is almost empty, however, it can be counter productive to fill it up completely if the next pilot is going to fly with passengers and close to the MTOW. I would then suggest that it is better to just fill it up to the volume where you know that the next pilot can have all choices open. For our DR-44 that would be filling it up to 3/4 of the main deposit (leaving reserve empty) (2). If the next pilot wants to travel along to a far distance needing more fuel he can always fill up more litres. This target weight will be different for each aircraft. (1) See here another post I wrote two years ago about weight and balance calculations in the same plane model. (2) Bear in mind that I found the airplane with precisely ~80L: coincidence or the previous pilot had come to the same conclusion at some point?